What is the MONTH Function? The MONTH function is categorized under DATE/TIME functionsFunctionsList of the most important Excel functions for financial analysts. This cheat sheet covers 100s of functions that are critical to know as an Excel analyst. 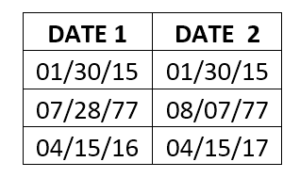 The function will return the month portion of a date as a number. The number would be between 1 to 12. 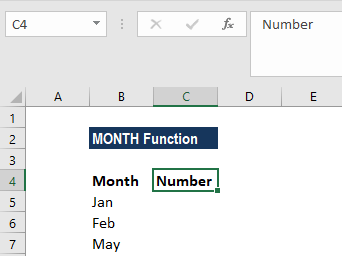 The MONTH function is available in all versions from MS Excel 2000. In financial analysisFinancial Analyst Job DescriptionSee a real Financial Analyst Job Description including all the skills, experience, and education required to be the successful candidate for the job. Perform financial forecasting, reporting, and operational metrics tracking, analyze financial data, create financial models, we can use MONTH with the DATE function to get the desired results. 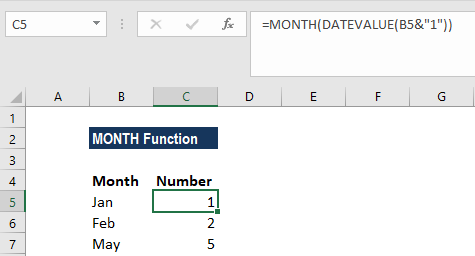 How to use the MONTH Function in Excel? In row A4, as the date is not in proper format, we used the DATE function along with the MONTH function. In this case, Excel extracts the month from the date in cell A2 as numbers, then concatenates them together to form a text string. The same thing is done with the date in cell B2, the month and year are extracted and joined together. We can even use this function to convert month names to numbers. For this, we need to use two functions DATEVALUE & MONTH. The formula to use is =MONTH(DATEVALUE(A2 & “1”)). Values returned by the YEAR, MONTH and DAY functions will be Gregorian values regardless of the display format for the supplied date value. We can get results that look like a date – “01/01/18” – instead of an integer. This problem is most likely to be because the new cell or column is formatted as a ‘date.’ In this case, it is only the formatting of the cell that is wrong, NOT the value returned by the function. The easiest way to correct this is to select the General Formatting option from the drop-down format menu of the Excel ribbon. It is usually located in the ‘Number’ group, on the Home tab of the ribbon. For the MONTH formula to work correctly, a date should be entered by using the DATE(year, month, day) function.